The Apple iPhone 8 Plus keeps a similar dual-12MP (wide+telephoto) camera setup from last year, and both sensors are sitting behind the same f/1.8 and f/2.6 lenses respectively. A large piece of scratch-resistant sapphire glass is supposed to keep them away from harm's way. What is new about the iPhone 8 Plus camera is the new sensors it uses. They are again Sony's Exmor RS sensors but they are different ones. Pixel size is the same though as both the wide-angle camera has a 1.22 µm pixel size and the telephoto camera has a 1.0 µm pitch as before. 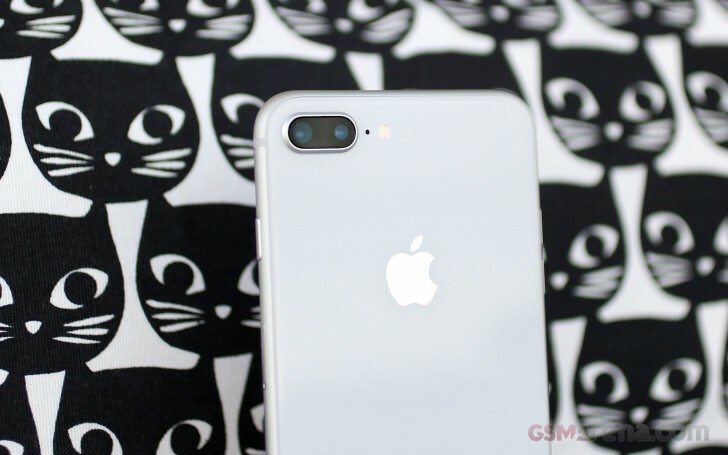 The upgrades list begins with a brand-new image processor and noise reduction algorithm, and with the help of the A11 chip the iPhone 8 Plus is now capable of real-time image and motion analysis - body and face detection. The video capturing also benefits from the new powers - there are 4K at 60fps and 1080p at 240fps modes. Apple also advertises the new phones to have "deeper pixels" which is another name for the camera sensor using deep trench isolation tech. Deep trench isolation is not a new technology and was first introduced on the iPhone 6s generation - also available on quite a few Sony Xperia (DTI) and Samsung Galaxy (ISOCELL) smartphone cameras. It's a technology for better pixel isolation on the sensor itself, which prevents light leakage between the neighboring pixels and thus improves the overall photo quality. 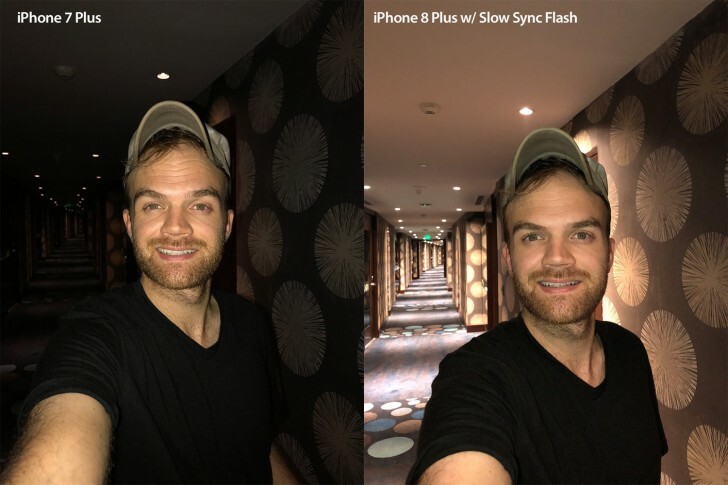 The quad-LED dual-tone flash from the iPhone 7 Plus is also available on the 8 Plus, but the new flagship supports slow-sync flash. It keeps the shutter open for a bit longer, letting in some of the ambient light, making the image look more natural and not as contrasty as with regular flash images. The Portrait mode on the iPhone 8 Plus has a new mode (still in beta) - Portrait Lighting. 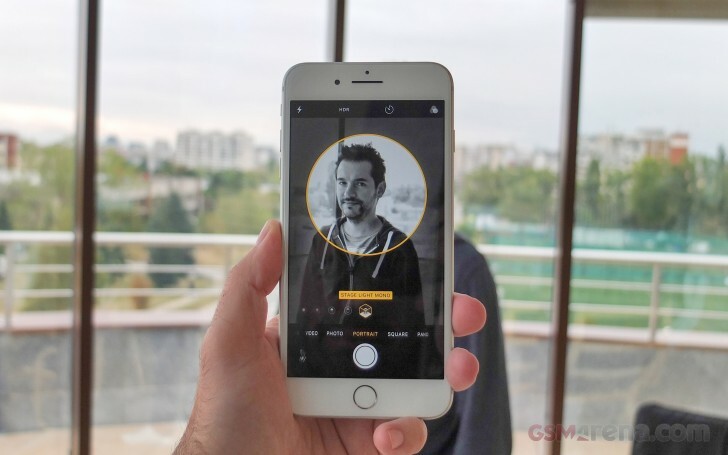 The dual camera scans the scene, identifies the face of your subject and (in real time, mind you) adjusts the tone curve of the face to make it better lit. And you can adjust the effect after you've taken a shot - neat! The Portrait Mode effect can be toggled off after the picture was taken. If you don't want the background blur, you can just disable it later. The new camera also comes with a new file format, yes, JPG's days are numbered. At least as far Apple is concerned. iOS 11 now saves all images in the HEIF file format and videos in HEVC (H.265) video format by default. This is done because of the more efficient compression these files provide. We can confirm - photos take about half as much space as before (1.4MB HEIF vs. 3MB JPG) and the same goes to videos. The phone will convert the images to an older format if shared from within iOS but if you copy images over USB, the original files are transferred only if you have macOS High Sierra. If not - you will get converted files - both pictures and video - in JPG and H.264 formats. The conversion is done in real-time while you are transferring the files without you even noticing. And mind you, the improved compression by these file formats doesn't come at the expense of quality. 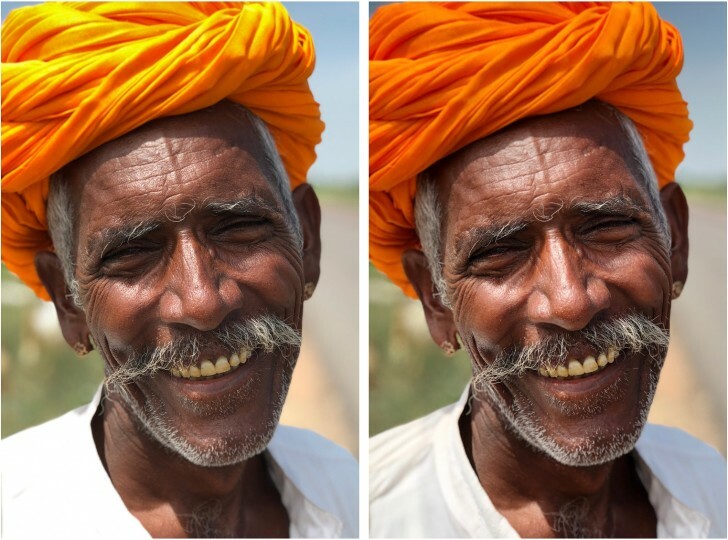 After careful pixel peeping, we saw no difference in quality between HEIF and JPEG and if there was a marginal difference between H.264 and H.265 it was in H.265's favor. On the other hand, quality with videos varies depending on how busy the scene is so the jury is still out on whether they are universally better than the H.264 ones. Furthermore, only the high-efficiency mode allows you to use the new 4K at 60fps and 1080p at 240fps video recording modes.